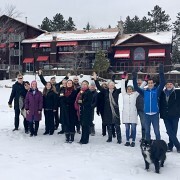 TORONTO, ON (January 22, 2019) – On the heels of their 25th anniversary, Grail Springs Retreat Centre for Wellbeing (2004 Bay Lake Road, Bancroft, Ontario) has once again been named winner of Canada’s Best Wellness Retreat for the third consecutive year, by the World Spa Awards, which acknowledge, reward and celebrate excellence across the rapidly evolving spa and wellness sector. In celebration of this milestone anniversary and award, the celebrated retreat announces Winter Spa Fest, a special offering for upcoming guests (outlined below), catering to the improvement of visitor’s physical, mental, emotional and spiritual wellbeing. 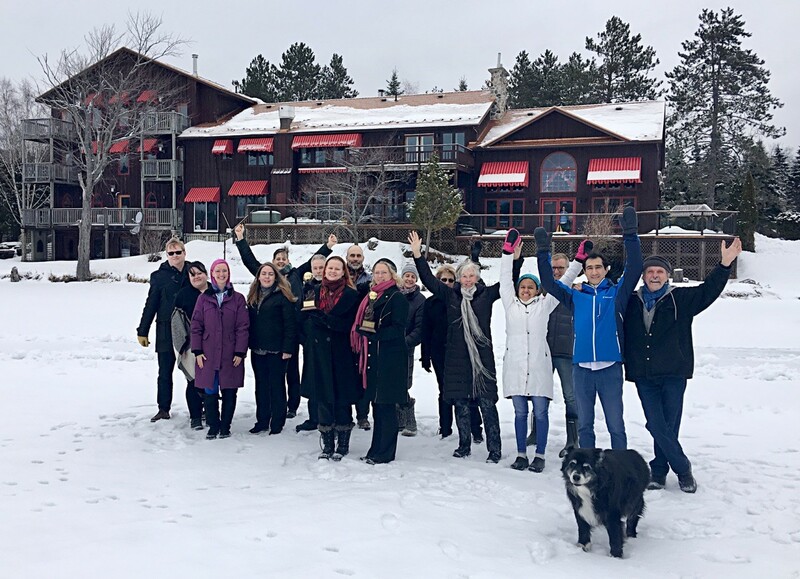 As a special thank you, during the period of February 9, 2019 to March 9, 2019, visitors of Grail Springs’ first ever Winter Spa Fest will receive 25th anniversary themed incentives such as 25% off all spa treatments, $25 spa tastings (anything from a back, neck and shoulder massage by the fire, a relaxing foot massage to Reiki), snowshoe excursions to their crystal outcrop meditation area, evening walks by lantern across the lake, campfires with Mayan hot chocolate chili and much more. The retreat will also be introducing their new aromatherapy product line ‘Grail Alchemy’ made from the beautiful waters of their spring-fed lake. Recognized for their educational component and specialized treatment processes such as the Cleanse and Energize Program and their signature Life Transformation Program, Grail Springs welcomes guests from all over the world to experience their healing alkaline waters, saunas, salt tubs and healing spa. From yoga, meditation and spiritual enrichment, to a full menu of healthy plant-based eating options, the full-service retreat offers cutting edge treatments, delivered by a dedicated staff of highly regarded coaches, instructors, healers and therapists. Setting the retreat apart from others is their unique environment which boasts a vital spring-fed lake and meditation installations such as a labyrinth, volcanic ash healing bed, and a unique equine meditation experience. The group also worked with a professional Geomancer to optimize the rich deposits of minerals of the area. The property highlights the crystals and granite rocks which leads to a unique crystal outcrop meditation area. No stranger to receiving accolades, Grail Springs will be adding their third World Spa award to an impressive list of recognition including Canadian Spa & Wellness Award Winner, Tripadvisor Traveler’s Choice Award, Tripadvisor Winner Certificate of Excellence and SpaFinder Best Body, Mind & Spirit Spa, among many others. With over 35% of guests returning annually for an average stay of 5 to 21 nights, Grail Springs has become a popular healing ritual for guests from around the globe. Located in the Mineral Capital of Canada, and the oldest exposed rock in the world, Grail Springs is close enough for an easy drive from Toronto International Airport, yet far enough to feel you have escaped to another world. With hundreds of acres of pristine forest, walking trails, crystal outcrop, abundant wildlife, meditation gardens and a curative spring-fed lake, individuals are inspired by the stunning natural beauty and are recharged by the potent healing environment that supports them. TORONTO, ON (November 13, 2018) — Selecting the perfect gift for families with newborns just got easier: Baby Dove is excited to announce that Canadians are now able to order personalized baby care products for friends, family and loved ones through their new microsite, MyBabyDove.ca. The thoughtfully designed two product gift set contains a bottle of Baby Dove Rich Moisture Tip-to-Toe Wash (384ml) and Baby Dove Rich Moisture Lotion (384ml) and can be customized to include any baby’s name on its packaging. The set is exclusively available online and retails for $29.99 including standard shipping. The Baby Dove range has been specially created with caring baby products that go beyond mildness to replenish essential moisture and nutrients – keeping baby’s skin soft and moisturized. Created with no dyes, parabens, phthalates or sulphates, Baby Dove is made with 100% skin-natural nutrients and is PETA-Certified Cruelty-Free. To purchase a My Baby Dove gift set, customers can visit MyBabyDove.ca and enter in any baby name along with a personal message. The gift set can be shipped to any address in Canada and retails for $29.99 and includes shipping and handling. Dove®, manufactured by Unilever, is the No. 1 personal wash brand nationwide. One in every three households uses a Dove® product, which includes beauty bars, body washes, face care, anti-perspirant/deodorants, body mists, hair care, styling aids. It also includes Dove® Men+Care™, developed specially for men, and Baby Dove®, developed specially for babies. Dove® is available nationwide in food, drug and mass outlet stores. Starlight Children’s Foundation® Canada and Toys”R”Us, Canada will gift shopping sprees to over 10 seriously ill Canadian children to help them create much-needed positive memories away from the hospital. WINDSOR, ON (November 8, 2018)- On November 20, 2018, Toys”R”Us, Canada in partnership with Starlight Children’s Foundation Canada, will provide eleven-year-old Colby, who was diagnosed with Ehlers-Danlos Syndrome (a connective tissue disorder) and suspected dysautonomia (a disorder that affects the autonomic nervous system), with a 3-Minute Dash shopping spree at a Windsor Toys”R”Us (3039 Howard Avenue, Windsor, Ontario, N8X 3T9). Starting at 7:00 a.m., Colby will have the chance to race through the store with his family and fill shopping carts with as many free toys as possible within a three-minute timeframe. The annual 3-Minute Dash program was designed to provide seriously ill children with much-needed positive memories away from the hospital. Colby has been struggling with his health from the young age of just 18 months old. Through his many symptoms, including low oxygen saturation, Bradycardia, Tachycardia, chronic pain, and cyanosis, doctors have had a hard time determining his many possible conditions. 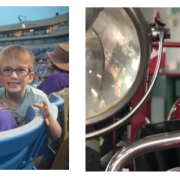 With the diagnosis of Ehlers-Danlos Syndrome just two years ago and a suspected dysautonomia diagnosis on the way, Colby and his family are doing their best to remain positive and embrace the fun moments in life. A big fan of the outdoors, Colby is looking forward to getting a new scooter and drone during his 3-Minute Dash. The 3-Minute Dash program is donated by Toys”R”Us, Canada as part of their long-standing partnership with Starlight Canada and has been expanded to gift over 10 Canadian families with shopping sprees in Ottawa, Barrie and Toronto in Ontario; Langley and Kamloops in British Columbia; Edmonton, Alberta; Pembina, Manitoba; Regina, Saskatchewan; Laval and Lasalle in Montreal and St. John’s, Newfoundland. For the past five years, dash recipients have been randomly selected as part of an internal Starlight Canada contest, in which families are asked to share the details of their child’s care journey and submit them to their local Starlight programs coordinator for entry. Over the past 20 years, Toys”R”Us and Babies”R”Us Canada have been and continue to be one of Starlight’s most involved and valued partners. Through in-store and online campaigns, 3-Minute Dashes, Presenting Sponsor of the Starlight Gala and donations to in and out-of-hospital programs, they have donated an incredible $19 million to Starlight and are extraordinary advocates of Starlight’s cause. 85 Hospital Grants - Monetary funding to support distractive entertainment for hospitalized children. 10,500 ER Admit Kits - A variety of care products for children and parents during unexpected hospital stays. 7,000 Baby & Toddler Fun Kits - Cuddly toys and games to distract very young children during unpleasant hospital stays. Baby Resources for Hospitals Program – Supplying easy to sanitize crib mobiles and activity centers along with special infant seats to cover 100 Neonatal Intensive Care Units (NICU) and Pediatric Intensive Care Units (PICU) across Canada. 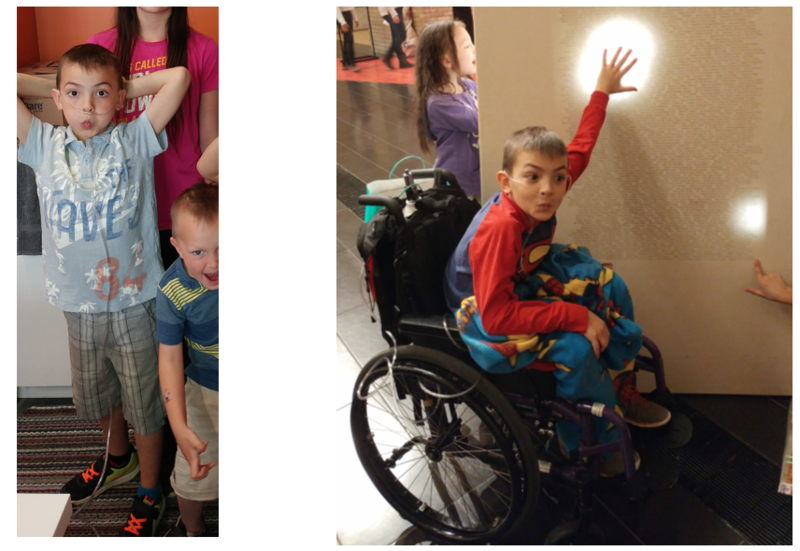 Starlight Children’s Foundation® Canada brightens the lives of seriously ill Canadian children and their families by bringing them joy, laughter and relief. For close to 30 years, Starlight Canada has spread millions of smiles to sick kids through a unique blend of family-centered programs and services from hospital to home. With your help, more kids and families will benefit from receiving a Starlight Comfort Kit in-hospital or relaxing at a Starlight Day Brightener out-of-hospital. Support Starlight Canada’s work by visiting www.starlightcanada.org and by following Starlight on Facebook, Instagram and Twitter and subscribing to our YouTube channel. Since 1984, Toys“R”Us Canada has been Canada’s leading dedicated specialty retailer of toys and baby products. As Canada’s trend authority in toys and baby products, the company brings national brands, exclusive products, innovative loyalty programs and unique partnerships to Canadians at its 82 stores across Canada and through its e-commerce sites Toysrus.ca and Babiesrus.ca. Committed to giving back to our communities, we focus our charity efforts on supporting children and their families whether enhancing resources and services, helping development through play or offering distraction and encouragement to seriously ill children. Toys”R”Us Canada is a subsidiary of Fairfax Financial Holdings Limited. For store locations and convenient online shopping, visit www.toysrus.ca and www.babiesrus.ca. HAMILTON, ON (November 7, 2018)- On November 21, 2018, Toys”R”Us, Canada in partnership with Starlight Children’s Foundation Canada, will provide six-year-old Ethan, who was diagnosed with acute lymphoblastic leukemia earlier this summer, with a 3-Minute Dash shopping spree at a Hamilton Toys”R”Us (970 Upper Wentworth Street, Hamilton, Ontario, L98A 4V8). Starting at 7:00 a.m., Ethan will have the chance to race through the store with his family and fill shopping carts with as many free toys as possible within a three-minute timeframe. The annual 3-Minute Dash program was designed to provide seriously ill children with much-needed positive memories away from the hospital. 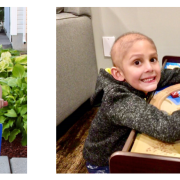 On June 1st, 2018, little Ethan was diagnosed with acute lymphoblastic leukemia. The past few months have been a difficult time for both Ethan and his family, but they are very much looking forward to taking a break from treatment to enjoy their 3-Minute Dash! A fan of building and creating things, Ethan can’t wait to pick up some new Lego sets and PAW Patrol figurines. Baby Resources for Hospitals Program – Supplying easy to sanitize crib mobiles and activity centersalong with special infant seats to cover 100 Neonatal Intensive Care Units (NICU) and Pediatric Intensive Care Units (PICU) across Canada. Strategy and channel enablement firm drives unique campaign to strengthen online consumer purchase experience. 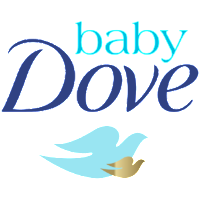 TORONTO, ON (November 7, 2018) — With the holiday season rapidly approaching, Nexus Commerce (a Toronto-based e-commerce strategy and channel enablement firm), has teamed up with Unilever Canada to introduce a direct-to-consumer campaign for a selection of the company’s Baby Dove products. 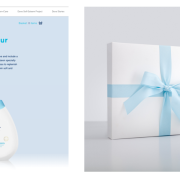 The campaign, titled My Baby Dove (mybabydove.ca), directs customers to a branded microsite, where they can create personalized Baby Dove products, and have them delivered directly to their home. The direct-to-consumer (D2C) approach aims to add new revenue streams, strengthen the relationship between consumer and brand, and provide unique product offerings to Canadian customers. The e-commerce market is booming in Canada, with revenue amounting to over 38.74 billion CAD in 2017, and projections suggesting it will reach almost 55.78 billion CAD by 2021. Throughout the last decade, Amazon has dominated the e-commerce marketplace and has even introduced its own line of private label brands. However, emerging D2C companies like Casper Mattress and Dollar Shave Club are disrupting this space with their unique approach to selling product. Not only are direct-to-consumer brands growing fast, but also operating more efficiently, using infrastructure to grow and connect more meaningfully to their customers. Direct-to-consumer channels are now being used in many different product categories. Large brands like Nike have reported that D2C retail and digital are accounting for 70% of their overall sales growth. With higher product gross margins than that of e-commerce, along with the increased ability for data retention and satisfying customer experiences, D2C is quickly becoming an attractive option for Canadian companies. This evident shift in focus was a driving factor for Mudit Rawat and Stephen Tallevi when developing Nexus Commerce, a consulting firm that assists in providing D2C strategies and solutions to their clients. With over 20 years of experience, the Nexus Commerce team has worked with a number of popular brands including Ben & Jerry’s, Nescafé, Vaseline, Grocery Gateway and Delissio. Aside from My Baby Dove this year, some of the group’s recent D2C campaigns include personalized Vaseline lip tin delivery across Canada, a campaign that went viral and saw purchase conversion rates of over 20% (average rates are generally 1.5%-2.5%) and frozen apple blossom home and office deliveries through the Ontario-based apple farm, Chudleigh’s. Nexus Commerce continues to provide direct-to-consumer solutions to many of Canada’s top brands. To learn more about Nexus Commerce and their services, visit https://www.nexuscommerce.co. Organization partners with Toys”R”Us Canada for 10th consecutive year to allow a Starlight child the chance to make her toy dream come true. TORONTO, ON (October 24, 2018) - Starlight Children’s Foundation Canada, in partnership with Toys“R”Us Canada, is proud to announce the release of their 10th Anniversary Limited Edition Collectible Bear, designed by five-year-old Starlight child Ella. Celebrating a decade-long collaboration between Starlight children and Toys”R”Us, this year’s bear “Sparkles” will be available both online and in-store across the country, with proceeds going directly towards brightening the lives of seriously ill children and their families. 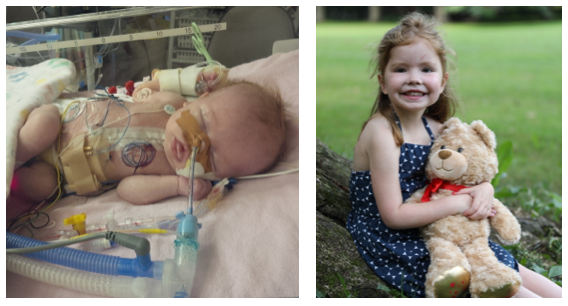 Before birth, Ella was diagnosed with transposition of the great arteries (a congenital heart defect) and developed increased blood pressure in the heart-to-lung system at only six months old. This adorable little girl has already received a donor artery, undergone nine heart surgeries, and until this summer, was connected to oxygen around the clock (requiring her to constantly be careful of tubing, particularly when playing with her big brother Cameron). Despite challenges in her life, Ella can always be found with a big smile on her face, which is why she requested that Sparkles must have a big smile too! Ella wanted Sparkles to have an embroidered heart on his chest (to represent her journey as a “heart kid”), along with gold, glittery feet (her favourite colour). Beyond Sparkle’s appearance, Ella says Sparkles can fly, and his favourite food is chicken and fries. He also gives GREAT hugs! Starlight Canada and Toys”R”Us Canada have been partners for 20 years. Through the support of their amazing team members and customers, Toys”R”Us Canada has raised over $19 million dollars for Starlight. Starlight Children’s Foundation Canada’s 10th anniversary collectible bear “Sparkles” retails for $19.99 and is available in Toys”R”Us and Babies”R”Us stores across Canada and online at http://bit.ly/sparklesbear. Since 1984, Toys”R”Us Canada has been Canada’s leading dedicated specialty retailer of toys and baby products. As Canada’s trend authority in toys and baby products, the company brings national brands, exclusive products, innovative loyalty programs and unique partnerships to Canadians at its 82 stores across Canada and through its e-commerce sites Toysrus.ca and Babiesrus.ca. Committed to giving back to our communities, we focus our charity efforts on supporting children and their families whether enhancing resources and services, helping development through play or offering distraction and encouragement to seriously ill children. Toys”R”Us Canada is a subsidiary of Fairfax Financial Holdings Limited. For store locations and convenient online shopping, visit www.toysrus.ca and www.babiesrus.ca. OTTAWA, ON (October 22, 2018) - On October 29, 2018, Toys”R”Us, Canada in partnership with Starlight Children’s Foundation Canada will provide nine-year-old Sam, who was diagnosed with acute lymphoblastic leukemia in 2017, with a 3-Minute Dash shopping spree at an Ottawa Toys”R”Us (St. Laurent Shopping Centre, 1200 St. Laurent, Ottawa, Ontario, K1K 3B8). Starting at 7:00 a.m., Sam will have the chance to race through the store with his family and fill shopping carts with as many free toys as possible within a three-minute timeframe. The annual 3-Minute Dash program was designed to provide seriously ill children with much-needed positive memories away from the hospital. Little Sam first became ill right before his eighth birthday last year. He’s had months of difficult treatment to endure, including tough medications and dreaded needles; but can still be found with a big smile on his face. 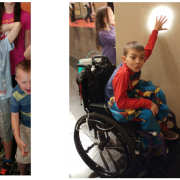 A big fan of Teenage Mutant Ninja Turtles and Star Wars, Sam sets his eyes on not only toys for himself, but plans to pick up a few extra toys to share with children in need. With his ninth birthday having just passed, Sam is poised to have a very memorable birthday this year, this time outside of the hospital. The 3-Minute Dash program is donated by Toys”R”Us, Canada as part of their long-standing partnership with Starlight Canada and has been expanded to gift 10 Canadian families with shopping sprees in Barrie and Toronto in Ontario; Langley and Kamloops in British Columbia; Edmonton, Alberta; Pembina, Manitoba; Regina, Saskatchewan; Laval and Lasalle in Montreal and St. John’s, Newfoundland. For the past five years, dash recipients have been randomly selected as part of an internal Starlight Canada contest, in which families are asked to share the details of their child’s care journey and submit them to their local Starlight programs coordinator for entry. 100% of the campaign funds raised will go towards brightening the lives of seriously ill Durham Region children. TORONTO, ON (September 13, 2018) – Beginning September 17th, citizens of Durham Region will be bursting with smiles as Tim Hortons kicks off their delectable annual #SmileCookie campaign. This year, Tim Hortons stores in the region have selected Starlight Children’s Foundation Canada as their official Smile Cookie partner. Starlight Canada is an organization that aims to brighten the lives of seriously ill children through a number of in and out-of-hospital programs. This year, Starlight Canada will receive 100% of the Smile Cookie sales to fund programs in the Durham region, much like those provided to Starlight alumni ambassador and Durham resident, Emily. Emily was born with Spinda Bifida, a severe birth defect of the spine that has affected all aspects of her life. Throughout her journey, Emily has endured nine surgeries, fifteen invasive procedures and is constantly battling infections. At the age of 11, Emily was enrolled with Starlight Children’s Foundation and received a very special wish: a trip to Disney! Funds raised this year will bring Fun Centers (mobile entertainment units featuring a flat screen television and a Nintendo Wii U gaming system preloaded with a wide variety of games), Comfort Kits (kits packed with a range of entertainment and distraction activities), Great Escapes (movie screenings, harbour cruises, holiday parties, sporting events and picnics), Day Brighteners (tickets to a concert, sporting event, museum and attractions) and Wishes directly to sick children in Durham. From September 17th to 23rd, those living in Ajax, Bowmanville, Courtice, Newcastle, Orono, Oshawa, Pickering, Port Perry, Uxbridge and Whitby can support Starlight by dropping in to their local Tim Horton’s to purchase a Smile Cookie for $1.00. Tim Hortons®, part of Restaurant Brands International, is one of North America’s largest restaurant chains operating in the quick service segment. Founded as a single location in Canada in 1964, Tim Hortons appeals to a broad range of guest tastes, with a menu that includes premium coffee, hot and cold specialty drinks (including lattes, cappuccinos and espresso shots), specialty teas and fruit smoothies, fresh baked goods, grilled Panini and classic sandwiches, wraps, soups, prepared foods and other food products. Tim Hortons has more than 4,700 system wide restaurants located in Canada, the United States and around the world. More information about the company is available at www.timhortons.com. Award-winning musician addresses the subject of mental health with September 12 release, “Break The Silence”. TORONTO, ON (August 21, 2018) – Award-winning Canadian electropop artist Velvet Code is thrilled to announce the September 12, 2018 release of his highly-anticipated first single “Break The Silence”, from his upcoming sophomore album. Collaborating with industry legend Wendy Starland (the woman responsible for developing and discovering Lady Gaga), “Break The Silence” is being billed as a confident follow-up to Code’s previously acclaimed work, which has been featured on hit television shows such as Jersey Shore and The Hills. Fresh from signing with the revolutionary AWAL/Kobalt label (representing artists like David Guetta and R3HAB), Velvet’s new single aims to shine light on the pressing issue of mental health. 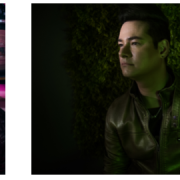 Throughout his career, the openly gay musician has dealt with varying degrees of depression and anxiety, and hopes that messages in his Freddy Mercury, Depeche Mode and Imagine Dragons influenced music will help listeners going through difficult times. No stranger to main-stream media, Velvet Code has been praised by the likes of Perez Hilton, Pop Justice, and Digital Spy (among many others), and has toured with popular electropunk band Mindless Self Indulgence. When writing his debut album “Black.Blue.Blind”, Velvet worked with legendary producer Mark Saunders (Shiny Toy Guns, Erasure, The Cure) and received the “Dance/Electronica – Song of the Year” award for his song “Say You Love Me” at the 8th Annual Independent Music Awards. In 2013, Velvet released “Get Outta My House”, which appeared on the Billboard Dance music charts for 15 weeks and peaked at #19. The single also spent 10 weeks on the UK Music Week Upfront Club Charts where it peaked at #3. Since 2013, Velvet has spent his time working on his follow up to “Black.Blue.Blind”, while also writing songs for other prominent artists. Fans can expect a full-length album entitled “Dreams and Nightmares” from Velvet Code this fall. The album is a collection of real-life stories from Velvet’s personal experiences over the past five years. ‘Break The Silence’ will be available on all major music platforms beginning September 12, 2018, including Spotify, iTunes, Apple Music, Google Play/YouTube, Amazon, Pandora, Deezer, Tidal, iHeartRadio, ClaroMusica, Saavn, MediaNet, and Shazam. Velvet Code is a Canadian electropop artist, known for his heavy 80’s musical influences and addictive dance floor tracks. A fixture on the Billboard, Dance and Club charts, the award-winning musician released his debut album ‘Black.Blue.Blind.’ in 2007. His sophomore album ‘Dreams and Nightmares’ is due to be released this fall. Wendy Starland discovered & developed Lady Gaga, was honoured by the Songwriter’s Hall Of Fame, contributed to Grammy nominated on Moby’s album Last Night, and was named VH1’s “Best Emerging Artist.” She is also a featured judge on the #1 hit TV show in France, Les Anges, which is in its 10th season. With over 100 songs licensed, Starland has worked and performed with Lady Gaga, Moby, Snoop Dogg, Wu Tang Clan, Billy Ray Cyrus, Capone, Apl.de.Ap of the Black Eyed Peas, Steve Aoki, Sheryl Crow, Jack White, ACO Val Vibrata Symphony Orchestra conducted by Maestro Luisella Chiarini, MTV, VH1, NBC, ABC, E!, CBS, and FOX. 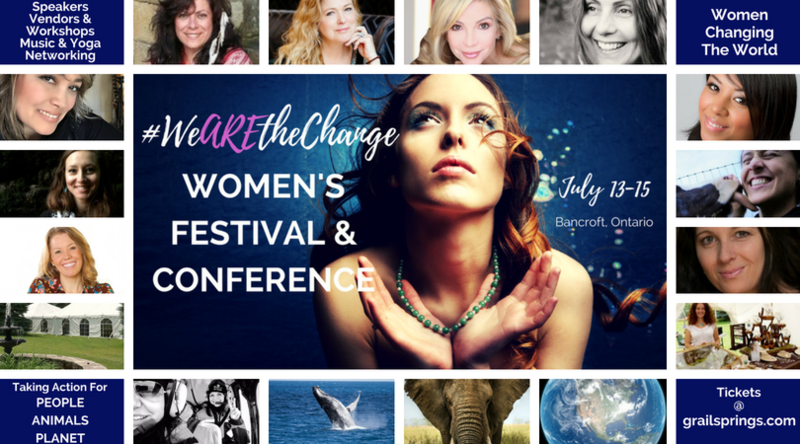 TORONTO, ON (June 21, 2018) – This July 13th to 15th, Grail Springs Retreat Centre for Wellbeing (2004 Bay Lake Road, Bancroft, Ontario) will play host to the ground-breaking women’s festival and conference, #WeAreTheChange. Hosted by Grail Springs founder Madeleine Marentette and MC’d by award-winning comedian Carla Collins, the event aims to help women define, shape and lead meaningful social change in people, animals and the planet. Featuring an all-star group of workshops and speakers, the event will also feature an outdoor spa, morning yoga, an evening sound bath concert, opening and closing ceremonies, music, drumming, an evening forest illumination walk, and many more activities. For just over 24 years, Grail Springs has been dedicated to improving the physical, mental, emotional and spiritual well-being of their guests. Located across one hundred acres in the heart of the Canadian Shield, #WeAreTheChange will provide attendees with a restorative and rejuvenating agenda, brimming with activities geared to defining and shaping a better future for themselves and others. 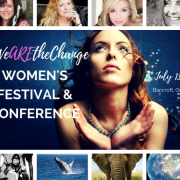 Speakers and workshop leaders at this year’s #WeAreTheChange will include: Christine Luckasavitch, Algonquin Anishinaabekwe of the Crane Clan; Evita Ochel, The Healthytarian; Dr. Zoe Lumiere, Allowing Love; Sara Bingham, Women’s March Canada; Jennifer Love, One More Woman Movement; Theresa Laurico, Socialight Canada; Joanne McArthur, WEAnimals; Vera Lopez, Spirits of the Earth; Helga Soley Vidars, Eagle Women Global; Nancy Peckford, Equal Voice Canada; Brigitte Breau and Marketa Schusterova, Sea Shepherd; Sarah Buchanan, Environmental Defense Canada and Cathy Mines, United Hearts of Allies. In addition to the speakers and workshops, conference members will enjoy a Shamanic Sound Meditation (designed to induce a deep state of relaxation and healing for the mind, body and spirit), outdoor yoga, a luxurious and relaxing mud bake, a traditional indigenous water ceremony and a healing forest illumination walk. Recently recognized as Canada’s Best Wellness Retreat by the World Spa Awards, Grail Springs is known for their educational and specialized treatment processes. The centre welcomes guests year-round from all over the world to experience their healing alkaline waters, saunas, salt tubs and a state-of-the-art spa. Tickets for this year’s #WeAreTheChange festival and conference start at $75 and can be purchased at http://www.grailsprings.com/festival-and-conference.